O Muslim Armies! Where is our Salahuddin who will Avenge the Murdered Children of Palestine?!! 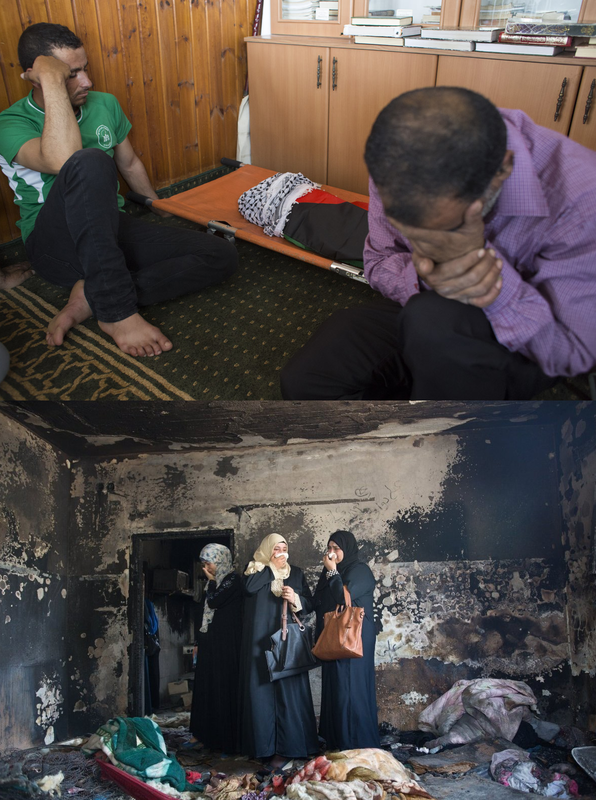 In the early hours of Friday 31st July, Jewish terrorist settlers firebombed two houses in Duma, a village in Palestine’s West Bank, burning to death 18 month old Ali Saad Dawabsheh. Ali’s parents and 4 year old brother were also critically injured in the attack, sustaining third degree burns. The terrorists sprayed ‘revenge’ and ‘price-tag’ in Hebrew on the walls of the houses. This act of pure evil reignites raw memories of the cold-blooded murder of the Palestinian teenager Abu Khdeir who was doused with petrol and burnt alive by Jewish terrorists last July. These utterly hideous crimes are simply the product of the hideous nature of the terrorist Zionist state which was born, sustained, and continues to exist upon the basis of terrorism and bloodshed and that has the murder of countless Palestinian children and babies to its name. Since September 2000, over 2060 Palestinian children have been killed by this criminal Jewish state, amounting to one child murdered every 3 days for the past 15 years. This includes over 550 Palestinian children killed in the merciless Zionist onslaught against the Muslims of Gaza last summer. Furthermore, extremist Jewish settlers have been provided a free hand to wreak havoc on the lives of Palestinians for decades. According to the UN, at least 120 attacks by Israeli settlers against Palestinians in the West Bank have been documented since the start of 2015. This includes frequent ‘price-tag’ attacks involving the burning of mosques and properties of Muslims. Palestinian media also reported that on Saturday 25th July, Jewish settlers seriously assaulted a Muslim child near one of the gates leading to Al-Aqsa Mosque – the day before extremist Jews stormed the Mosque complex under the protection of the Jewish army. All this is alongside the continuing deaths of countless Muslim children in Gaza, dying as a result of the medical, fuel and other shortages in the Strip due to the Jewish entity’s crippling 8 year long siege on Gaza. It was reported that this January, 4 infants aged from 1 month to 18 months old died from the bitter cold in Gaza. The dire conditions in the Strip due to last year’s bombardment and the ongoing blockade have resulted in inadequate shelter from freezing temperatures. Since the establishment of this barbaric Jewish state, its terrorist forces and settlers have been allowed to perpetrate their crimes and bloodbaths against the Muslims of Palestine with impunity, supported by the conscienceless Western governments and regimes of the Muslim world. Meanwhile, the powerless Palestinian Authority simply issues meaningless condemnatory statements as the children of Palestine bleed or burn to death, while continuing their security agreements with this criminal Zionist regime. O People of Power! O Sons of the Muslim Armies! For how long will you watch on while this terrorist Jewish state annihilates your brothers and sisters of Palestine, defiles your sacred sites, and murders your children??? Do the tears of your mothers in Palestine, shed over their slain children not burn your heart with rage??? Are you waiting for those in the international community to protect your Ummah – those who founded, funded, and strengthened this criminal, illegal state and have erected a wall of silence around its crimes and engage in their own terrorist campaigns against Muslims across the world??? Do you not wish to gain the great honour bestowed upon Salahuddin Ayubi and Qutuz of liberating this blessed land from its occupiers, and the great reward of rescuing its people from the clutches of this cancerous regime that is a scar on the face of the Muslim world??? Then we call you to break your allegiance to your treacherous, idle rulers who have abandoned your brothers and sisters and who send their armies to fight wars against Muslims in Yemen, Iraq, Syria and Pakistan on behalf of Western governments rather than mobilise them to protect the children of Palestine from slaughter! We call you to give your Nusrah to Hizb ut-Tahrir to establish the glorious Khilafah based on the method of the Prophethood which will send its soldiers without delay to liberate this Blessed Land, avenge its martyrs, bring it under the folds of Islam once again, and raise a glorious future for this Ummah and its children. اے مسلم افواج!ہمارا صلاح الدین کہاں ہے جو فلسطین میں قتل کیے گئے بچوں کا انتقام لے؟!